If there is one game which comes to mind when you think of a casino, it might very well be roulette. The ball and wheel game is considered to be one of the most popular gambling games in the world and the best part is you can play it both online and off. We take a look at the game of roulette and the variations you can play at both land-based and online casinos. If you’ve ever wanted to play roulette, you’re in luck. It only takes a few minutes to learn how to play, and there’s really no strategy to memorise. To play at a land-based casino simply walk in – after having your ID checked – and locate the table with a minimum bet suited to your bankroll. Minimums generally start at around $2 and can go right up to high roller limits, depending where you are playing on the gaming floor. For the online variant, you will need an account with a secure online casino, such as the many listed in the table above, and it will need to be funded. There’s plenty of friendly payment methods such as Visa, MasterCard, Neteller, Skrill and Paysafecard to make a safe and easy deposit with. 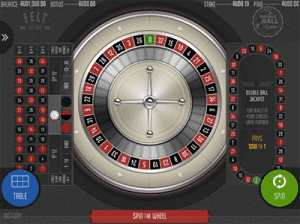 Click on a roulette variant of your choice, with many titles starting at a minimum of $0.10. For both options you are now ready to play real money roulette. Roulette is played using a large, spinning wheel with a number of collared pockets. Each pocket has its own number, ranging from 1 through 36, along with a zero – and in some cases, also a double zero. On each spin, the dealer will place a ball on the outer rim of the wheel. The ball will make its way around the outside of the wheel until it slows down, at which point it will fall into one of the pockets. The number and colour of the pocket are recorded, and all winning bets are then paid out. Players have a wide variety of bets they may place on each spin. At land-based casinos and on live dealer roulette titles on the web, all bets must be made before the croupier signals all bets are off, which usually happens a few seconds after the ball has been set in motion. Online, you can play at your own pace only spinning when you press the button on RNG titles. You can place bets using the chips – which you can physically place on the layout at brick and mortar casinos and click and drag online. 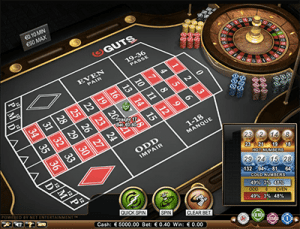 The bets a player may make can be divided between inside and outside bets, based on where they appear on the roulette table layout. Straight Bet: A bet on a single number, which pays 35-1 if that number wins on the next spin. Split: This bet covers two numbers that are adjacent to each other on the layout. If either number wins, the bet pays 17-1. Street: A bet on a row of three numbers. If any of the three numbers win, the bet pays 11-1. Corner: A bet on a square of four numbers. If any of the four numbers win, the bet pays 8-1. Six Line: A bet on two adjacent rows of three numbers each. If any of the six numbers win, the bet pays 5-1. Odd/Even: This bet covers all odd or even numbers on the wheel. If an appropriate number wins, the bet pays even money. 1-18/19-36: This bet covers all numbers in the specified range. If the bet wins, it pays even money. Dozens: This bet covers a group of 12 numbers (1-12, 13-24, or 25-36). If any number in that range wins, the bet pays 2-1. Columns: This bet covers a full column of 12 numbers. If any number in that column wins, the bet pays 2-1. Red/Black: This bet covers all pockets of the appropriate colour. If a number of that colour wins, the bet pays even money. 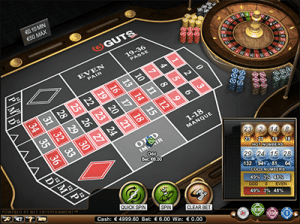 Online and offline, roulette games can be split into three main categories types – European, French, and American roulette. French roulette offers the lowest house edge out of all the variants, which is why it is considered to be the best. The game is similar to European rules, which you can see below, but there are additional rules including La Partage which reduces the house edge – down to just 1.35%. 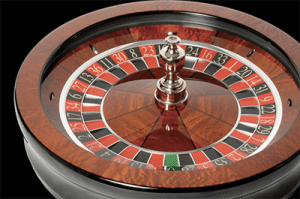 European roulette wheels feature only a single zero on the wheel, which makes the house edge on most bets just 2.70%. There may be the option of the the “en prison” rule, which reduced the odds in the player’s favour. This rule states that if you make any of the even money bets, such as even or odd, and the result of the spin is a zero, you will not lose your bet. Instead, the bet will become imprisoned, and you’ll have a chance to rescue it next spin if a winning number comes up. You won’t win the bet, but it will be returned to you. This rule essentially cuts the house edge on those bets in half. The specifics of this rule can vary, as casinos differ on how they treat additional zero results for bets that are already imprisoned (some treat this as a loss, while others keep the bet in prison until a non-zero result occurs). The third main variant is American roulette. These games feature two zeros on the wheel, adding a double zero (00) to the European layout. Since the payouts remain the same, this extra spot on the wheel only benefits the casino, pushing the house edge to 5.26%. It’s therefore best to avoid this variant, online and off. At land-based casinos you may come across a few variants, such as Rapid Roulette – a fast-paced version – and other variations. Our top-rated roulette sites are listed in the casino table at the top of this page, and we recommend Raging Bull Casino as our top-rated casino site for players from United States, which has some excellent welcome bonuses available for new players along with a great range of roulette variants, online slots and other exciting table games.